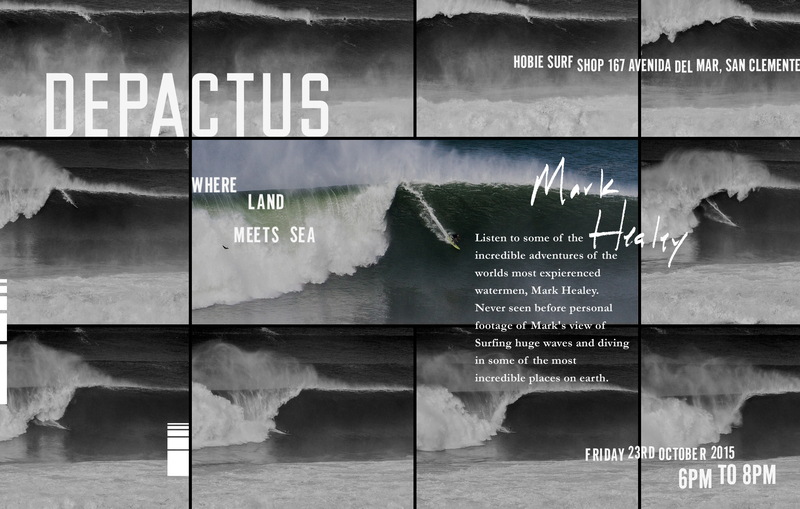 Hobie Surf :: Hobie X Depactus Present ‘Talking Story with Mark Healey’ on October 23rd at Hobie San Clemente!! ‘Mark Healey’s relentless pursuit to experience all that the ocean offers is perhaps only exceeded by his passion to protect and preserve it’ -Depactus. Known as one of the most prolific watermen on the planet, he not only excels at paddling into the biggest waves, he also spear fishes and free dives at a level amongst the most elite in the world. He is a watermen’s waterman. Well respected and universally revered amongst his unique class of hellmen peers, Mark Healey is like none other. Join us on October 23rd at Hobie San Clemente for a night of story and as yet unseen footage from the life of this extraordinary gentleman. Healey will be in shop sharing his own story personally with us. Bringing along clips of not only surfing and diving, but his own unique view while tagging great white sharks. His affable and pleasant demeanor and well spoken easy storytelling ways are not to be missed. This event is family friendly, open to the public, and free of charge. Time :: 6pm-8pm This event is free of charge and open to the public. This entry was posted in General and tagged depactus, hobie, Hobie San Clemente, Hobie Surf Shop, mark healey, mark healey spear fishing, riffe. Bookmark the permalink. ← Hobie Surf :: Hobie X Quiksilver Present ‘Talking Story with Mark Richards’ on October 27th, 2015 as Moderated by Bob McKnight!! !